Enjoy our friend Jim Dunlop's guest post about Lake Orta, one of the one day destinations from Turin! Originally studied Chemical Engineering and Sales and Marketing, Jim worked for some large multinational companies including in Casale Monferrato and Bergamo. He ran his own consultancy and sales business before retiring a few years ago. Married to Julia hence the title of this post which is our retirement project! As yet he has not started a blog but he will do once he has enough stories to put in it. As the first rays of sunshine burst over the hills behind Sacro Monte di Orta, bringing a summer vibrancy to our balcony I put down my pen and let the warmth sweep over me in the cool stillness of the morning. Not a sound was heard save the solitary cooing of a pigeon on the roof above. Isola di San Giulio lay at peace with itself and from this distance the morning traffic on the opposite shore could not be heard. Nothing was stirring in Pella. High above on a precarious ledge Madonna del Sasso sat watching another day arrive. 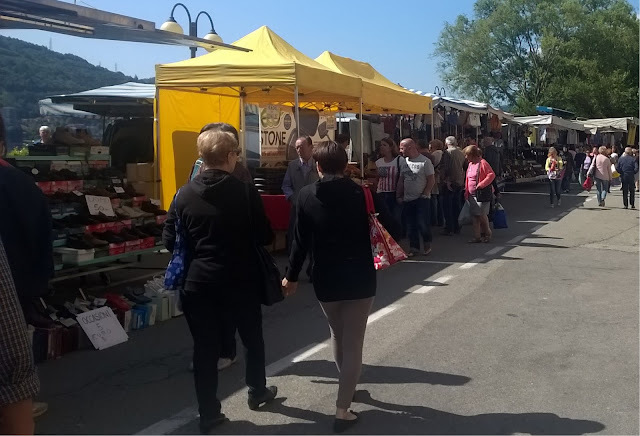 The previous evening on our arrival in Piemonte, via the Sempione, we had decided today would be a slow day of slow food, slow wine and slow walking around the little town of Orta san Giulia with its narrow alleys and streets and its gloriously open main square. Decisions about where to eat and sit and watch the world go by could be taken later. Before taking the ferry we needed to check that Pella was still the same as we left it last year. Pella is the forgotten gem of Lago d’Orta with it sweeping promenade, manicured trees and flowers it is deserving of more visitors but I guess part of its charm is the relative quietness. As usual the ferry was on time we took our seats at the prow to take in the short tour of the south of the lake including a rather grand house above the south shore which we call the Jetson’s House (it is truly a unique structure). Soon on landing at bustling Piazza Ing Motta where everyone is spoiled for choice with regard for places to sit, people to watch and local food to taste with wine. 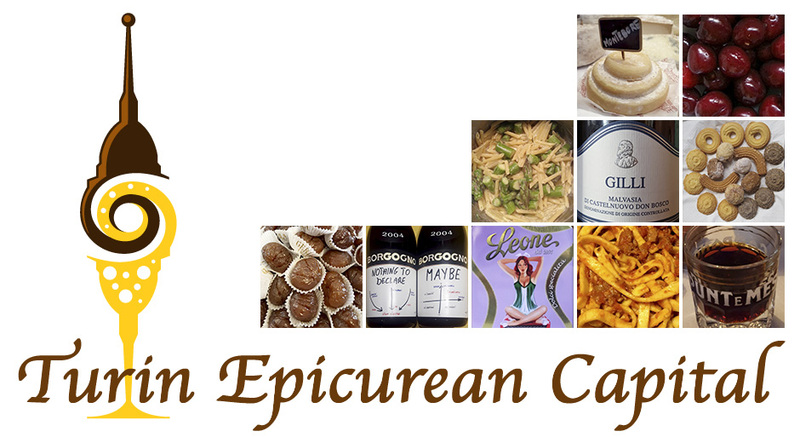 Would it be a gastronomic delight or just straight forward good Piemontese food. Being people who like to take our time we opted for outside Venus beside the jetty. Here you can sit, eat and people watch, maybe even catch a view of a bride being rowed to her wedding at the public gardens. Time is not a constraint in this charming unspoiled place. Some folk like to pair wine with food I prefer to pair wine with scenery and here with our wonderful fresh crisp Tuna salad we almost always opt for the latest harvest of Arneis by Matteo Correggia. Nothing can beat the feeling that sweeps over you on the first sip of young Arneis and look out to the Isla floating on a calm lake. 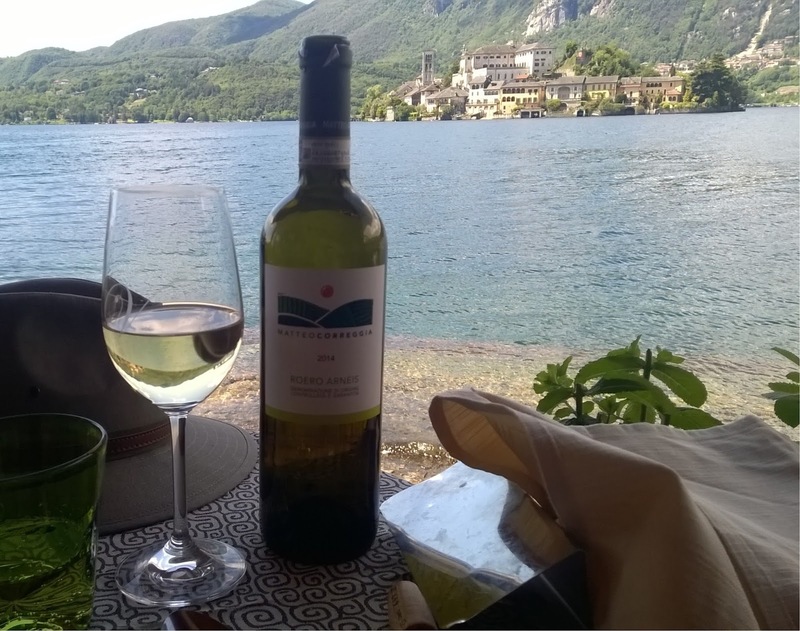 The Arneis vineyards are some way from Orta but this grape was made for sitting by the lake and relaxing. All was well in the world, as the world strolled passed while we were eating. At lunch in Orta in summer time you will lose count of the different languages you hear. The good news is that the locals and their dialects can still be heard as well, for Orta has not lost itself to tourists like say Portofino. Orta is still a real living town. There are certain parts that are not just quite right but this perhaps adds to its rustic charm. Our reconnection with Italy was not yet complete but soon we professed that all was well when we had our espresso taken with a grappa Morbida. On paying up, we went for our regular walk around the peninsular, strangely most tourists miss this beautiful every changing walk and so don’t get to the see lake in all its beauty. Five minutes from the busy square there is beauty with peace and tranquility. The regular ferry then took us back to Pella for a slow afternoon of reading as the sun slowly dropped behind us. The table at the Imbarcadero was booked so we knew there would be a warm welcome from the host and a table from which we could watch Orta san Giulio and the island come alive with light in the ever darkening night sky. Above us Madonna del Sasso sat watching over us! Tonight we would enjoy the cooking style of Piemontese food which is never over seasoned or blasted with spices but food with a delicate taste which the local wine would enliven and bring the question of why only in Piemonte does food taste like this? 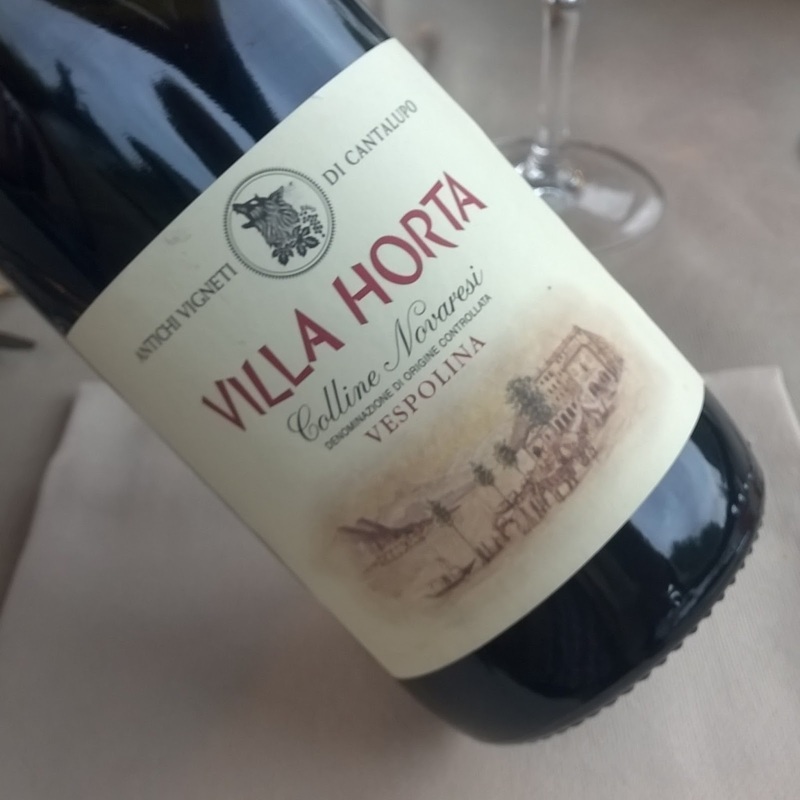 For wine we chose a local red a Vespolina called Villa Horta by Cantalupo. Vespolina is like Pella a forgotten gem which has much to offer once people get over their love for the main attractions. The dinner passed quickly as we chatted about how wonderful this peaceful little lake really is with it being almost devoid of tourists and global brand shops. We wish we could keep it that way but we should not be selfish. Sleep came easily to us that evening. Next morning up early, as anyone who knows the lake realizes that a very large market happens every Thursday at Omegna and today was Thursday. A benefit of Pella is that the Ferry starts its morning market day run from Pella so those boarding there get the best viewing seats for the slow the sail north to Omegna. This morning the lake was special as there was not a drop of wind to disturb the surface of the lake. As we sailed towards the island and it with the church and its tower loomed about and below us in total reflection. As yet no water taxi had disturbed the waters. A sight we had never seen before and it will live in our memories for ever. Northwards we headed crisscrossing the lake, picking locals up at every halt. A feeling of anticipation was in the air for today the weather was good and the market could be explored slowly. If you need fresh fruit, vegetables, meat, flowers or really anything, this is the market to come to. It must stretch for about a kilometer along the roadside from the centre of town. Retail therapy with a hint of magic, price negotiation is a must and part of the fun of visiting the market. Omegna and the surrounding area has more to offer than its market as it is the home of two of Piemonte’s many well known global brands in Bialetti for Moka makers and the giant that is Alessi. Today we did not have time to visit, but for sure the Alessi factory shop is well worth a detour to see and buy. The Ferry returns south in the afternoon, so lunch was to be taken outside near the ferry lading station. 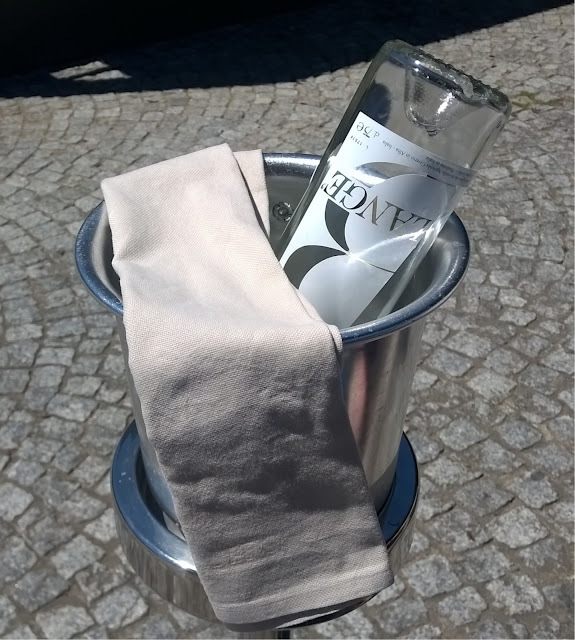 The choice what food is always a simple decision but as there are so many options for wine this can be quite a long decision making process as you study a wine list. Once again it was to be drink local or as local as you get. We averted our gaze from the many Langhe wines on offer and went for a nebbiolo from Gattinara “TreVigne” by Travaglini. This wine is just pure liquid velvet. We both love the Langhe and the Roero for the wines but sometimes people forget that Piemonte has many fine wine producers outside the sphere of Barolo and Bararesco. The Travaglini is one such wine. Slow lunch over we boarded the ferry and returned slowly south to our holiday abode in Pella. Must admit I slept most of the way. Piemonte and its food and wine can have that effect you you! Landing at Pella we had to take an artisan ice cream from the little shop where they always mistake my Scottish accent for being German and each year I put her right on this point. Maybe next year I will wear my kilt when I go for an ice cream. So ends two days in Paradise, however there were five more to come!